During three days of discussions, exhibitions and ﬁlm screenings, gate48 would like to introduce innovative perspectives on the militarization of Israeli society and culture. 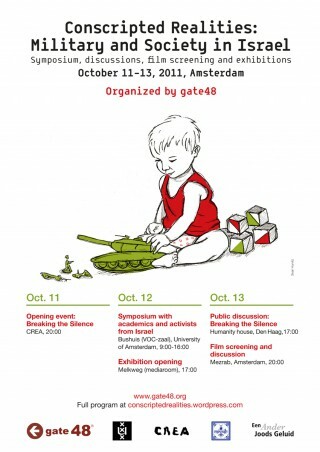 Militarism is part of everyday life in Israel, closely linked to the ongoing reality of armed conﬂict and occupation. As a result, militaristic approaches to the conﬂict have become dominant, while feminist critiques and other alternative voices have been ignored or dismissed. Conscripted Realities aims to bring forth these voices in order to examine how the military and civil society interact in the formation of the national subject. Academics and activists from Israel will discuss the topic from various angles, including the economic aspects of militarization, the militarization of education and media, and the effects of militarization on gendered and ethnic minorities in their struggles for equality. The symposium is accompanied by a digital exhibition “Making Militarism Visible”, curated by the Israeli feminist organization New Proﬁle. The exhibition reveals the subtle but strong inﬂuence of militarism on Israeli popular culture.